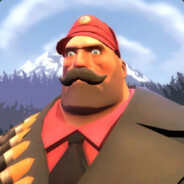 I main Fat Scout in Team Fortress 2. I do not have any formal written rule for friend requests, but I am somewhat picky about friend requests. However, I happily accept friend requests from members of EdgeGamers Organization. I also often accept friend requests from people who seem pretty cool and nice to me, especially if they play the same games as me. Any of my friends may play with me in any game at almost anytime. I usually play Team Fortress 2, and I often allow my friends to join my party. Heavy wishes you счастливого Рождества.